I’ve admitted many times that I’m a big snacker! And I would even ditch a meal to enjoy extra snacks! There were days when I was a student on the streets of Kolkata, the ultimate destination of street food lovers and on my way back all those deliciousness on the pavements used to invite me and I never had any choices but accepting their invitations. Singara, Kochuri, Alur Dom, Khasta Kochuri, Chaat, Dahi Vada, Aloo Vada, chowmein and yes sometimes fuchka and churmur used to be part of them too as sourness has never been my forte. But when it comes to Egg Roll or Egg Chicken Rolland Mughlai Porota it is a complete different ball game. Oh boy! I’ve been a true lover of them, till date! And there is no shame in admitting that ignoring such a beauty for a long time is a crime. But it’s better be late than never you know; so I’m (finally) penning down the recipe of Bengali style Egg Chicken Roll aka Kolkata Chicken Kati Roll. No matter how much fun we had in childhood or how bad we were at study; things will pass on and times will change; for sure! Those golden days are gone and I’ve ended up in the western part of India from far eastern part of India; life has been such a roller coaster for me! I’ve adopted many things here and then I miss few things from there. But it is the food which makes me feel to go back there; and street food has captured the majority of the scene. I try to cook and eat these soul foods as much possible but then again now I have to keep up with work and other parts of my life. And also I can’t spare my newly bought weighing scale too; I don’t want it to die so early (that is the lamest excuse you’ve heard in your life, I know)! So my foul food cravings get the answer only during Durga Puja and Poila Baisakh and I try to keep up with the promise, ‘satisfaction guaranteed’! Every year I try to cook Bengali sweets or desserts on Indian festival days which are mostly time consuming. But this year I had little time in hands as I’m juggling between many jobs right now. So my good old Bengali style Egg Chicken Roll aka Kolkata Chicken Kati Roll is here this time to keep you guys entertained and soulful! This Kolkata Chicken Roll recipe is most widely used in roll centres of Kolkata. If you stand in front of any of these street vendors which you have to do after placing the order, you will see them following same procedure way too fast; someday I’ll document a video and share here with you all. As for now you have my Bengali Egg Chicken Roll aka Kolkata Chicken Kati Roll recipe with the video to watch & cook. To watch the video, go to my YouTube channeland do subscribe for regular updates. Don’t forget to hit the ‘Like’ and ‘Share’ button after watching the videos. Start the entire process by marinating the chicken. Take a large clean and dry bowl and add cubed chicken pieces in it. Gradually add hung curd, tandoori masala, garam masala, salt & ginger powder. Mix everything nicely to coat chicken with marinade well. Once done, cover the bowl tightly with a cling film and refrigerate for minimum 1 hr. to overnight. Once you are ready to cook the chicken, remove it from refrigerator and keep it on kitchen counter for 10-15 mins. Heat mustard oil in a shallow pan on high flame. Once oil is smoking hot, add chopped garlic and green chili and sauté. Once garlic is browned add chicken pieces into the pan without any marinade. It’s better to shake off all the marinade from chicken pieces before adding to the pan. Brown the chicken on high flame for first 4-5 mins and then simmer and allow the chicken to cook in its own juice. Add Kashmiri red chili powder to the chicken and mix well. Once chicken is half done, add the reserved marinade and continue cooking on high flame until chicken is almost done. Add sliced onion and mix thoroughly. Once chicken is done, add more green chilies if you can handle heat and chopped coriander leaves and mix gently without breaking chicken pieces apart. Once moisture evaporates completely from the pan, stuffing is ready. Sprinkle some more coriander leaves on top and remove from flame immediately. Set aside to bring to room temperature. Generally I cook stuffing and refrigerate it in air tight glass container so that on the next day I’ll get most of the things ready before lunch time. Cover the dough with cling film and allow it to rest for 30 mins to overnight in refrigerator. (I always keep overnight unless I’m in hurry). After the resting period the dough will be pliable comfortably. (See Tips)Now use the dough whenever you are ready to cook. Knead the dough lightly for 1-2 mins to make sure it is completely pliable and smooth before using. Roll the dough by hands and form a cylindrical log of the dough. Cut the log into 8 to 10 equal portions. Take out each portion and roll into a round dough ball and press gently to form a pattie. Follow the same with rest of the portions. Keep them covered with cling film or wet kitchen towel. Dust the work space with flour and take out one small dough ball at a time, coat in flour and roll out into a large disc or roti using rolling pin. Flip sides in between and keep rolling; sometimes little dusting of flour will be needed to prevent sticking on rolling board but do not stretch the roti too much. Once the roti is evenly rolled out keep it on a wide flat plate; do the same with all. Crack an egg in a small dry bowl; sprinkle salt and beat lightly with fork or whisk. Set aside for later use. Heat oil in a flat pan/tava and grease the pan well with spatula. Once pan is hot add one rolled out roti on the pan and cook the paratha by pressing &rotating gently with spatula. Soon bubbles will appear on surface and it’s time to flip the paratha. Flip quickly and cook other side for 5-10 secs. Now pour the lightly beaten egg on paratha and spread gently with the spatula to cover the paratha completely. Allow to cook egg for 2-3 mins and flip gently to cook for another 1-2 mins or until egg is done nicely. Once done, flip for one last time and remove from flame. Set aside on a flat plate until you are done with rest of the paratha. Add onion slices, cucumber slices on one end of the paratha. Arrange chicken pieces from previously cooked stuffing on them; sprinkle some chopped coriander leaves with green chilies. Squeeze little lemon juice on top. Now, wrap the roll with the stuffing along the butter paper and tuck it in at the bottom to seal neatly. Voila! 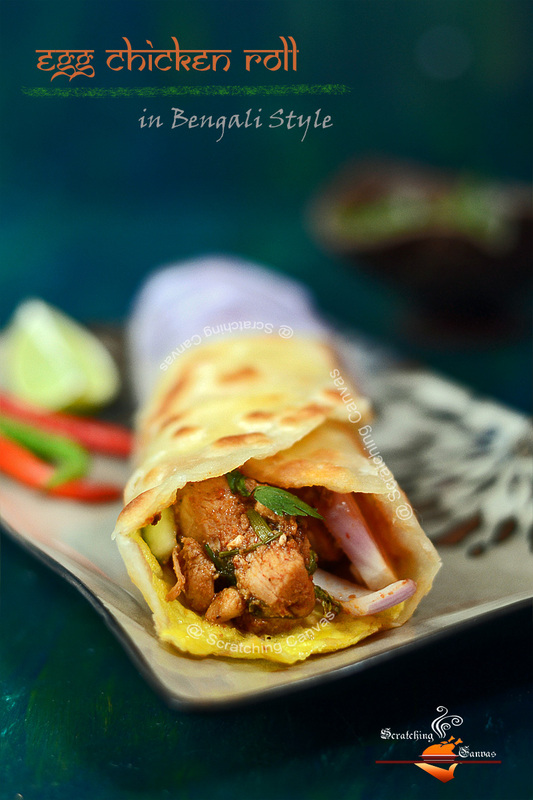 Kolkata style Egg Chicken Roll is ready to grab. Serve this Bengali street food with some extra tomato ketchup and dash of chili sauce. This Chicken Kati Roll tastes best when served hot, right after cooking; always! It is meant for immediate consumption, storing it for later consumption is not a good idea. 1. Garlic powder can also be used with ginger powder in the marinade. As I personally prefer the flavor of fresh garlic, I used some while frying the chicken. 2. While mixing ghee (or butter) and flour, be careful to mix thoroughly. It is important to coat the flour with the fat to restrict the gluten to develop. 3. Once wet ingredient is added to the mixture, don’t over mix things. This will lead to stiff dough. 4. It is important to keep the dough covered with cling film to avoid dry stretchy dough. 5. I personally prefer to spread the tomato ketchup along the paratha; it helps to seal the edge nicely with the stickiness of ketchup. It seems you have missed the adding of hung curd during preparation process for marinating. Although in the ingredients you did mention hung curd 200 gms. Anyhow thanks for sharing this wonderful receipt.